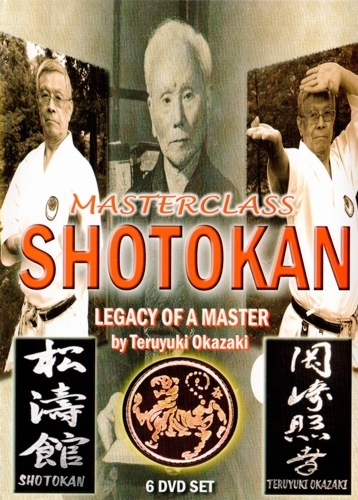 MASTERCLASS SHOTOKAN is a complete presentation of the techniques, philosophies, and training methods of the art of Karate-do. Instructed and presented by Master Teruyuki Okazaki, a direct disciple of the founder of Karate, the Grandmaster Gichin Funakoshi, this series is a complete step-by-step guide to the Shotokan style. Covering and analyzing in detail all the aspects of Tsuki Waza, Uchi Waza, Keri Waza, Uke Waza, Tachi Waza, plus Funakoshi's 15 original Kata and different Kumite categories ¨C including sparring against multiple opponents, this 6 DVD Special Set is a classic collection of inspiring Karate-do knowledge, technique and philosophy. This series was filmed at Master Okazaki's world headquarters in Philadelphia, guides you from the fundamental principles to the advanced applications of Karate-do. All the sections are demonstrated clearly from start to finish, in different camera angles to facilitate easy and accurate learning. Like none other before, this professional production combines direct instruction with actual footage of Master Okazaki teaching the technical elements in a group class at the Honbu Dojo. Also included are special sections on Shotokan history, covering the beginnings of the art to the creation of the JKA and the early days in America to its expansion around the world. Additional technical segments about the proper use of Seiza, Makiwara training, and Bunkai practice also are part of this series.